Extended length shaft fits Toyota Tundra with heavy duty tow packages. Stainless Steel Barbell lock, fits 5/8 in. receiver openings. 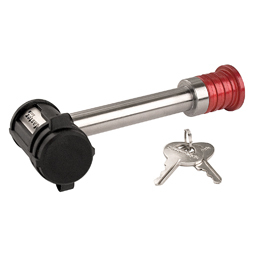 Push to Lock locking mechanism - push lock body onto pin firmly and remove key. Class III/IV; 10,000lb. Load rating. Swivel Head design for easy access. Weather Tough® seal protects lock mechanism. K1 Key Blank.